Louis Espagnol, the Native manager of the Hudson’s Bay Post and chief of one of the Spanish River bands was the predominant individual in the mid-19th century at Pogamasing. The honour of this distinction for the early 20th century would go to Bill Plaunt. The two men came from two vastly different worlds, one being an Anishnabe chief, the other a lumberman. Despite their very different appearances and backgrounds, they shared some commonalities. They both made their living from the forests. They were assertive and capable leaders in their businesses. They were strong family men who also demonstrated an enduring concern for the welfare of those they were responsible for. And they both made Pogamasing their seasonal home. Plaunt came from a farming community west of the Renfrew and started in the lumber industry at a time when working in the bush was a natural complement to farming. After working with his father until he was 19, he moved to Blind River to work in the lumber business. It was here that he met Mildred Hicks and they married after she graduated from nursing in 1912. That same year, Plaunt started working for the Harris Tie and Timber Company owned by his cousin, F.X. Plaunt of Ottawa. 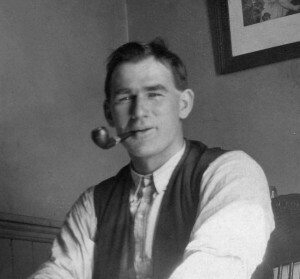 In 1919 he established a new partnership with Ed White of Sudbury to cut pulp in six townships surrounding Duke Lake, the headwaters of the east branch of the Spanish River. After ten years of cutting pulp on this limit, Plaunt began to look for a way to utilize the substantial jack pine stands that were not needed for the pulp contract. He secured a contract to supply railway ties to the CPR and then searched for a place on the Spanish River where he could drive the jack pine to a mill site close to the CP line. This brought him to the stop at Wye, alongside the Spanish River, and a short distance from Lake Pogamasing. Plaunt bought the timber rights for the area, built a mill, established logging camps and created a village consisting of a school, store and office, and homes for his employees. But just as he became established, the stock market crashed and Plaunt, now on his own as his partner wanted out, had to find a way to survive the severe economic downturn. When he lost the tie contract with the CPR he approached Inco in Sudbury to sell his ties as mining timbers. When they rejected his offer, he went to the head office in New York and returned home with a bigger contract. His business acumen went beyond lumbering and in the 1950’s he formed a partnership with George Miller and James Cooper to buy the Sudbury Star and CKSO radio, and eventually established the first independent television station in Canada.